It’s apple season! And ever since my boys were little, we have made the two-and-a-half hour road trip up to Flat Rock, North Carolina to go apple picking in the mountains. Some of our best memories as a family were made up at Sky Top Orchard. We’ve picked all kinds of apples over the years, everything from our favorite Honeycrisp—which has a really short season, but worth the early trip up to the orchard—to the late season Pink Ladies and everything in between. Now that my kids are older they have a lot going on. With school, sports and an active social life that makes mine look pretty sad, finding a day with nothing going on is rare. But I wasn’t willing to put our apple picking tradition aside. I discovered this quaint orchard about an hour away from our house in York, South Carolina. Although Windy Hill Orchard only offered Stayman Winesaps, it was just enough apple picking to satisfied my need to keep our family tradition alive despite our busy schedules. The freshly pressed apple cider and apple doughnuts were comforting and quite delicious. But for me, the star of the visit was that hard cider tasting bar. That alone was worth the trip. We returned home with several baskets of the Stayman Winesaps, which are firm, sweet, tangy and really good dessert apples. And in keeping with tradition, I made a big batch of applesauce. 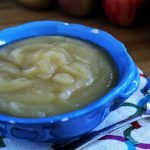 I had Gala, Fuji and Red Delicious already in the fridge, so I threw a few in the pot with the Stayman Winesap to enhance the flavor of this super simple applesauce. The cool thing about applesauce is that it goes great with almost everything. Pork, chicken, waffles, pancakes and Ritz Crackers. I know it sounds crazy, but Ritz Crackers dipped in applesauce is awesome! I’ve loved this combo since I was a kid. I’m not much on canning, so I just store the applesauce in the freezer until I’m ready to use it. Although my kids are growing up way too fast and life is crazier than ever, I’m glad we took the time as a family to stop to pick some apples. Place the apples in a large saucepan with the water and bring to a boil. Cover, reduce the heat and simmer until the apples are soft and cooked through, about 25 minutes. Remove the saucepan from the heat. Use an immersion blender to puree the apples in the pot until smooth. (You can also puree the apples, in batches, in a blender until smooth.) Serve warm or chilled. 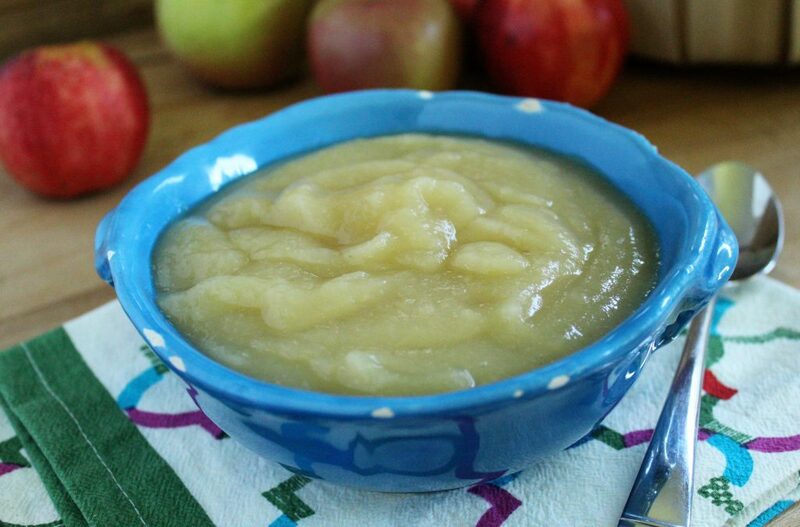 Store the applesauce in an airtight container in the refrigerator for up to two weeks or in the freezer for up to one year. This entry was posted in Fruit, Recipes, Side Dish and tagged apple orchard, apple picking, applesauce, family, tradition on September 21, 2016 by Andria Gaskins.